The former varies wildly in length and form; the latter is concise and consistent. The former is what happens by default; the latter never happens by accident. While many repositories' logs look like the former, there are exceptions. The Linux kernel and git itself are great examples. Look at Spring Boot, or any repository managed by Tim Pope. Re-establishing the context of a piece of code is wasteful. We can't avoid it completely, so our efforts should go to reducing it [as much] as possible. Commit messages can do exactly that and as a result, a commit message shows whether a developer is a good collaborator. 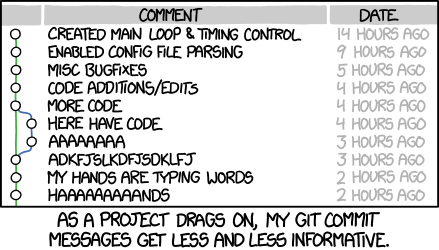 If you haven't given much thought to what makes a great git commit message, it may be the case that you haven't spent much time using git log and related tools. There is a vicious cycle here: because the commit history is unstructured and inconsistent, one doesn't spend much time using or taking care of it. And because it doesn't get used or taken care of, it remains unstructured and inconsistent. But a well-cared for log is a beautiful and useful thing. git blame, revert, rebase, log, shortlog and other subcommands come to life. Reviewing others' commits and pull requests becomes something worth doing, and suddenly can be done independently. Understanding why something happened months or years ago becomes not only possible but efficient. A project's long-term success rests (among other things) on its maintainability, and a maintainer has few tools more powerful than his project's log. It's worth taking the time to learn how to care for one properly. What may be a hassle at first soon becomes habit, and eventually a source of pride and productivity for all involved. In this post, I am addressing just the most basic element of keeping a healthy commit history: how to write an individual commit message. There are other important practices like commit squashing that I am not addressing here. Perhaps I'll do that in a subsequent post. Style. Markup syntax, wrap margins, grammar, capitalization, punctuation. Spell these things out, remove the guesswork, and make it all as simple as possible. The end result will be a remarkably consistent log that's not only a pleasure to read but that actually does get read on a regular basis. Fortunately, there are well-established conventions as to what makes an idiomatic git commit message. Indeed, many of them are assumed in the way certain git commands function. There's nothing you need to re-invent. Just follow the seven rules below and you're on your way to committing like a pro. Though not required, it's a good idea to begin the commit message with a single short (less than 50 character) line summarizing the change, followed by a blank line and then a more thorough description. The text up to the first blank line in a commit message is treated as the commit title, and that title is used throughout Git. For example, git-format-patch(1) turns a commit into email, and it uses the title on the Subject line and the rest of the commit in the body. This is not so easy to commit this with the -m switch. You really need a proper editor. If you do not already have an editor set up for use with git at the command line, read this section of Pro Git. There are a number of other contexts in git where the distinction between subject line and body kicks in-but none of them work properly without the blank line in between. 50 characters is not a hard limit, just a rule of thumb. Keeping subject lines at this length ensures that they are readable, and forces the author to think for a moment about the most concise way to explain what's going on. Tip: If you're having a hard time summarizing, you might be committing too many changes at once. Strive for atomic commits (a topic for a separate post). So shoot for 50 characters, but consider 69 the hard limit. Trailing punctuation is unnecessary in subject lines. Besides, space is precious when you're trying to keep them to 50 chars or less. Each of the seven rules you're reading about right now are written in the imperative ("Wrap the body at 72 characters", etc.). The imperative can sound a little rude; that's why we don't often use it. But it's perfect for git commit subject lines. One reason for this is that git itself uses the imperative whenever it creates a commit on your behalf. To remove any confusion, here's a simple rule to get it right every time. Remember: Use of the imperative is important only in the subject line. You can relax this restriction when you're writing the body. A good text editor can help here. It's easy to configure Vim, for example, to wrap text at 72 characters when you're writing a git commit. Traditionally, however, IDEs have been terrible at providing smart support for text wrapping in commit messages (although in recent versions, IntelliJ IDEA has finally gotten better about this). Take a look at the full diff and just think how much time the author is saving fellow and future committers by taking the time to provide this context here and now. If he didn't, it would probably be lost forever. In most cases, you can leave out details about how a change has been made. Code is generally self-explanatory in this regard (and if the code is so complex that it needs to be explained in prose, that's what source comments are for). Just focus on making clear the reasons why you made the change in the first place-the way things worked before the change (and what was wrong with that), the way they work now, and why you decided to solve it the way you did. Remember that whether you use Bash or Z shell, there are tab completion scripts that take much of the pain out of remembering the subcommands and switches. The Pro Git book is available online for free, and it's fantastic. Take advantage!